This is part of the ongoing series, Make Summer Camp, which is designed to help me boost my skills as a Maker, and have a broader range of insight and depth of mindset around Making. 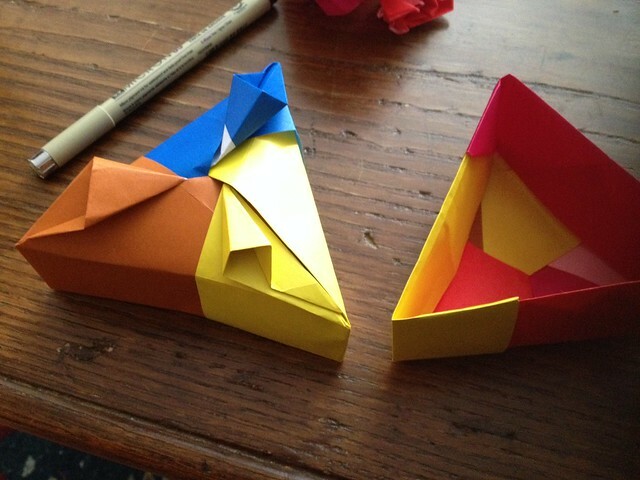 In that context, origami might not make much sense. Isn’t Making more about drills and 2x4s, more about welding and chicken wire. But as I said recently on Twitter, origami is one of those ways we teach the critical skills of 2D to 3D — how to take a flat object like a sheet of paper, and produce a three-dimensional object like a dog face or a cat or a horse or a crane. It’s easier to do this with paper than plywood, and somewhat less expensive. And it’s one of those skills at which I need practice. So here goes. I am not happy either with the triangular box, or its lid, but it’s still easier than the hexagon box with the star-shaped lid. Both the lid and the box are made of three sheets of origami paper apiece; both require a bit of geometrical chicanery that displeases me, e.g., “slightly fold the paper in half, but only crease it on one edge to about 2cm.” First, I have no reference sense of how much two centimeters is. I sort of know that it’s sort of close to an inch. But I don’t know. And, it’s a measurement dependent upon starting with a specifically-sized piece of paper, rather than ANY sized piece of paper that happens to be square. So my sensibilities around this measure are offended. But second, it’s not actually geometry. A geometry proof has procedures, and procedures can be learned — you can make your hands do them with ruler and straightedge, or you can make your hands or mind do them with origami paper and a bone folder… but you can do them. This process for this box requires something other than a learned process that is repeatable; it requires knowing more than the usual order. So I dislike it a bit. The Seashell envelope is more fun — but again, it’s based on a specific size/shape of paper, namely the A4 European standard. I learned it from pinterest via this post on a Korean website, and I like it a lot. There’s an envelope neatly stuffed into this, and a discreet bit of wax could make it into a sealed envelope with this elaborate shell-fold on the outside. I like it a lot, I just wish it wasn’t dependent upon a specific size of paper. I have to figure out some adjustments to the pattern for US Letter paper. If I do that, it demonstrates the kind of learning that I’m hoping to get from this exercise — namely, learning to produce 3D objects from 2D materials. Even so, it’s an elegant design, and I’m looking forward to thinking of a use for it — like an invitation to a fancy party, for example. The owl is going to take a bit of time. I think I should have used a piece of paper with a bit of a higher contrast than red to pink or pink to red. Brown and yellow would have wound up looking more owlish. And it doesn’t stand up on its own, which wasn’t clear from the pictures. OR maybe I made it wrong. Three times. It took me three ruined pieces of paper before I got this not-quite-right model down. 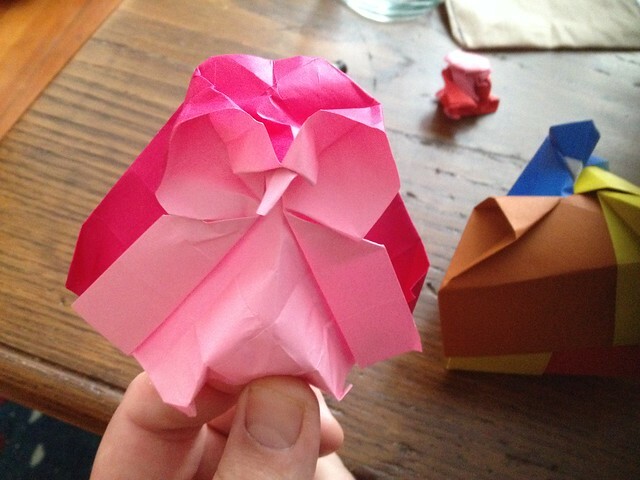 I learned the owl fold from this site (which appears to be in Denmark but is also in Spanish… Spanish?) I’m pleased enough with the big box that folds into an 4-pointed star, but I also felt like I wanted to learn some other box and container folds for the purpose of creating talismans and mojo boxes, as well as teaching kids about the importance of packaging in design work. This kind of thing matters, and caring about what the box looks like is critical. So I also taught myself this fold for a box which has a fold-in-on-itself lid, and which I’ve seen in photographs as made out of cardstock and other beautiful papers. It appears to hold up quite well! This third box, as you can see, has an internal compartment which is somewhat smaller than the frame of the lid. With this poor-quality copier paper, it’s a little flimsy, but I’ve since made one out of heavier cardstock, and it’s pretty sturdy. I must have folded this one a dozen times while visiting family in Maine last week, because it was so satisfying to fold. 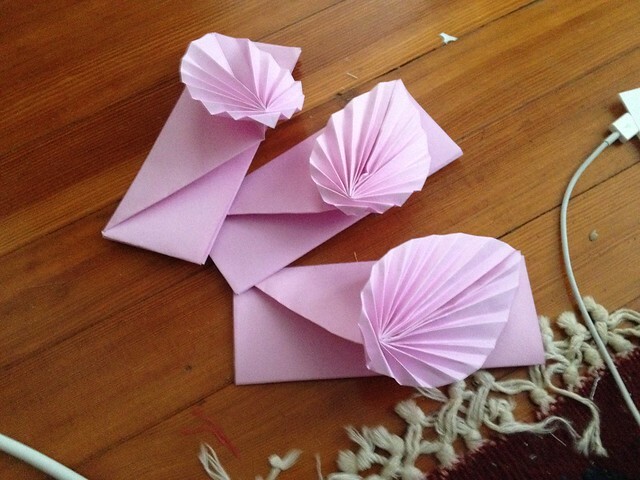 Even though I’ve folded it a dozen times, though, I don’t think I’ve actually learned this fold. It’s a fairly complicated procedure, unfortunately, and doesn’t share much in common with the masu or measuring box. 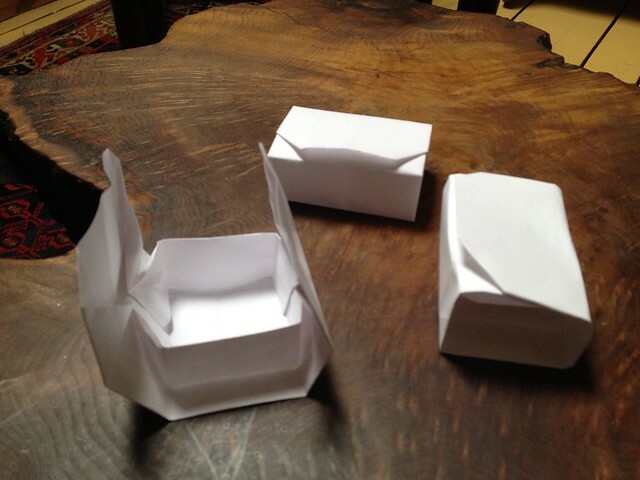 I’m about to try folding a second origami butterfly box, which appears to be useful for containing secret messages. But I don’t like the video format of learning nearly as much as following printed directions with drawn diagrams or folding photographs. It’s much more effort to watch the video, pause, do the step, and then unpause the video. Funny how the act of learning things from multiple sources shows us what our strengths and weaknesses are as learners. I’m sure you’ll enjoy the butterfly-box. I’d love to see a picture when you fold it! I’ve folded it (wrong) three times already. I’m embarrassed, really. But I’l try again tomorrow. That is the spirit of origami, practice, practice practice… no need to be embarrassed! Perhaps you want to practice with a heart box first (link below). The first steps are very similar to the butterfly, and the finished model folds flat. I took inspiration on that box to create the butterfly.